While launching a product is easy, the difficult part is getting people interested in it. That is the place where PR comes into the picture. Typically, PR strategy for a product launch involves a press conference, dissemination of press release and media interviews. If everything goes well, the next day people get to know about it in a newspaper or a news channel. Our strategies depend on traditional media to such an extent where we don’t really employ emerging platforms. To make sure you know, these platforms capture sizeable audience who is willing to learn about new products on a real time basis. The 2014 Most Memorable New Product Launch (MMNPL) survey, led by Schneider Associates and Sentient Decision Science, indicates only 10 percent of consumers learned about a new product through Facebook in 2009. But in 2014, that number rose to 29 percent, and Facebook nabbed the second spot behind the ever-prevalent television commercials (68 percent). Then, some buzz on digital platforms, free sampling of the product, etc. are the tactics used to bolster the launch. Sounds fine, but what about the pre-launch buzz? Are we involving people through an experience that will reverberate an emotional connect with the brand? Taking cue from this, here’s the definitive list of handpicked platforms which will amplify the reach and recall of the new product amongst stakeholders. Thereby, reducing the reliance on traditional media. Live Streaming Tools and Applications – Facebook Live, Twitter-owned Periscope, Meerkat and YouTube’s live streaming, have taken the social media by storm. These tools can engage the brand's online community via live video feed of launch events and spark off conversations across social media platforms. Digital populace can also chat and comment during the feed. At the 2016 Auto Expo, the unveiling of Jaguar XE was live streamed through Facebook Live (via group page) and Twitter’s periscope. On Facebook alone, this 23-minute live feed got 2.67 lakh views, 29,404 likes, 2,274 shares and was commented on 1,713 times. Teasers & Leaks – What’s life without a little suspense? Likewise, if you don’t have a little suspense or secrecy around a product launch, how will you make it tempting for consumers and media? To achieve this, deliberate release of very few details or images of the product will drive everyone into a frenzy. 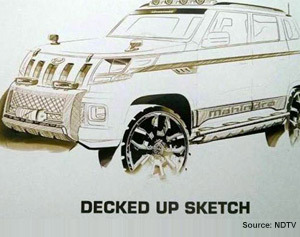 Remember, how Mahindra & Mahindra gave us a sneak peek of the compact SUV, TUV300. The released sketches of its design inspired by a battle tank, created quite a buzz across media platforms. The launch of TUV300 became one of the most awaited event. By the time it actually happened, TUV300 was no longer a new product as its popularity surged. As a consumer, I personally kept a close eye on the launch of this amazing piece of work. 360 Degree Video – Be it riding a new sports bike or river rafting in a destination for which you just launched a holiday package, 360 videos allow users to look across angles freely and feel like they are actually present there. Facebook and YouTube are already hosting 360 videos, making it a regular part of our life. Interestingly, Star Plus promoted a 360 video on YouTube before the launch of their show ‘Dance Plus’ featuring a dance gig and Choreographer Remo Dsouza. As per Lighthouse insights, the video received 34 million impressions on Facebook and reached over 10 million people on Twitter. YouTube viewership stood at more than 7 lakh. All this buzz led to soaring viewership for the show’s first episode. Quirky Launch Invites - Gone are the days when boring invites were either mass mailed to media or faxed. To make stakeholders aware about something big is happening, brands need to engage them from the very start. What better way could be to build on the curiosity through a quirky symbolic invite? One could also end up creating an experiential campaign around it in the pre-launch stage, creating buzz not only in media but amongst consumers as well. While launching two new stores in Mumbai in Feb, 2016, GAP, the classic American casual wear brand invited key influencers such as actor Ranveer Singh, among others for the opening of their stores in a rather unique and localized manner. Their invite had a quirky branded blue lunchbox along with T-shirt delivered by none other than Mumbai’s iconic Dabbawalas. As per a news report by everythingexperiential.com, this activity resulted in almost 1,000 posts on Instagram & Twitter alone, which garnered over 7.2 million impressions, in just 4 days. I personally still recall the campaign and superb job carried out by GAP India. Social Media Launch – Spectacle of upcoming cell phone brands through invite only option or flash sales on ecommerce portals is trending. But my suggestion is more social in nature rather than selective. Why not consider introducing new or limited edition products first over social media platforms like Facebook, Twitter, Instagram or Pinterest. Incentivizing people’s presence on social media through exclusive access to new products, will enhance their overall experience. Thereby, building affinity for your brand. 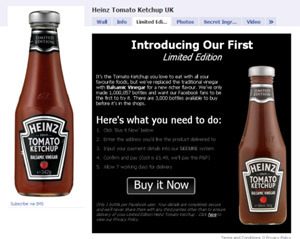 In United Kingdom, Heinz introduced a limited edition balsamic-vinegar-ketchup variant by putting on sale 3,000 bottles exclusively on its Facebook page and rest of it (around 997,037) after 20 days at retail stores. This was the first time a food product was exclusively launched via Facebook, and the first time branded food products have been sold via Facebook in the UK. No wonders, it got everyone talking and the company decided to replicate this strategy in other markets. Customer touchpoints – Retail stores, customer support, associate channels, social media communities, direct mailers and invoicing among others are immediate extensions of brands, need not be ignored. While customer touch points are leveraged post the launch, activating them before will involve people at an early stage. This will make them stop everything, pay heed to what your doing and make them eager for your offering. I could only think of Apple mastering the art of using customer touchpoints meritoriously. For instance, Apple takes it online stores globally offline hours before the launch of any new product. One can’t buy anything till the launch is complete. The store usually returns to life soon after the event is over, displaying the new products up for sale. Facebook event – Facebook users create uncountable events on the platform every single day. You’d be surprised to know that people are using it for even marriages. Yes, my friend did that. Obviously, this was a private affair and done for selected folks. As a marketer or PR pro, think how you will be able to use this? Today, brands are already present on Facebook with their fan page, having dedicated following. Create a public event and use this tool with an objective to apprise people of new developments of your brand. Similarly, events seeking participation of followers in person at a designated locations can be explored as well. I am sure this can be practiced on other social media platforms as well. Deepak Kapoor (@DeepTheK) is a communication specialist, working with Perfect Relations Pvt Ltd. He is also the founder of 'The Commune', Mumbai's first innovative and interactive ommunity for PR and corporate communications professionals.